Houzz approached us to help them with an article about kitchen design do's and don'ts. It was an interesting exercise to verbalize what we as designers do with intuition and experience. The Samaras/Sorensen Residence Dining Room (it is called the Stannage Avenue Residence on our Houzz page) has been featured on Houzz, in an article called "Extendable Tables Solve Dining Dilemmas". 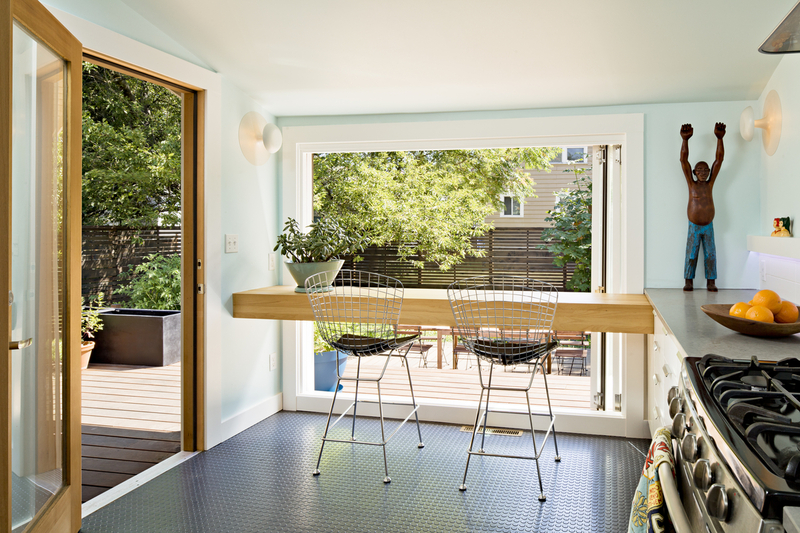 The extendable table wasn't designed by us, but the article points out that the corner dining bench (our custom design) saves space while allowing a comfortable area to gather. This bench design was our solution to provide efficient seating, open up the house layout, and maximize storage all at the same time. The bench extends through the Living Room, where it becomes more seating and a media cabinet. Entertaining solutions, just in time for Thanksgiving - I hope you get cozy and enjoy the Holidays! Last week, Lynn and I were honored by the Girl Scouts of Northern California as 2 of the top 100 women who have "made a significant impact to sustaining the environment, economy, or community". We attended a beautiful reception at the Rosewood Sand Hill in Menlo Park, where we were amongst a dense crowd of very interesting men and women. Best of all, the Space Cookies (a Girl Scouts robotics team) were demonstrating their basketball hoop-shooting robots, and helped answer some of my burning questions about robotics opportunities for children. Awesome! As to why we think we won this award.... we have very detailed green standards, both for our clients' projects and within our office. Integrating low-cost and no-cost sustainability measures has been a standard practice in our office for several years, so we don't feel like it's really something we need to brag about. But apparently, helping our clients navigate through their myriad of sustainable cost-value decisions, while still maintaining a standard of beauty and utility, is something this 100-year old organization wanted to celebrate. We are so honored and humbled by this recognition, and we are inspired to keep serving our clients and the community with our integrated and holistic approach. Novak Residence featured in "A Nook of One's Own"
The Novak Residence kitchen (it is called the 12th Street Kitchen on our Houzz page) has been featured (again!) on Houzz, in an article called "A Nook of One's Own". This is also the project that was recently a finalist in Dwell Magazine's Caesarstone Challenge contest. We are so honored by the outpouring of support for our projects, and these articles are proof that good design can resonate with many people. Thanks all! We are Finalists! We'd love your vote! Our Novak Residence kitchen design made the top 30 out of 323 entries for the Dwell Magazine Caesarstone Challenge! (Look for "Craftsman Kitchen Transformation" under the Kitchen & Bath category). Please vote here. The entry with the most votes wins two slabs of beautiful Caesarstone, which we will donate to a local non-profit. Leave a comment below, we will give YOU a special discount on our services if we win! Also, every voter is entered for a chance to win a HD Flip camera from Dwell. Voting ends at 11:59 p.m. PST this Thursday, 3/1/12, so don't delay. Be sure to peruse the other entries for inspiration, too. Special thanks to Mike and Rachel Novak, the owners who made the magic happen; to Scene Construction for their excellent craftsmanship; and to Lincoln Barbour, for his beautiful photography. Novak Residence kitchen featured in "Cozy Tables for Two"
The Novak Residence kitchen (it is called the 12th Street Kitchen on our Houzz page) has been featured (again!) on Houzz, in an article called "8 Cozy Tables for Two". This is timely for me, since I was sitting with a friend at a bar counter in a coffee shop today and was noticing how much more intimate it is to sit next to each other, than to sit across the table. Pair it with a view and you'll never want to leave! We are featured in Lincoln Barbour's year-in-review! We had the pleasure of working with Lincoln Barbour for the first time, in 2011. We are honored to be included in his year-in-review. You can also check out our blog post about our experience with Lincoln. We look forward to more fun shoots with him this year! Our project is Best of 2011! Happy New Year everyone! We hope your year is off to a great start. We just found out that the one of our projects, the Kovtunovich Residence, was mentioned in the Best of 2011 in the Homes and Gardens section of The Oregonian. You can find it in the "Trends of the Year" section, where they praise the owners, Ian and Tonia Kovtunovich, for "mixing it up" by building a very modern addition to their traditional bungalow. The original article for the project was published in January, but we are so flattered to be mentioned again at the end of the year. Thanks again for all your support, and we look forward to another exciting year.